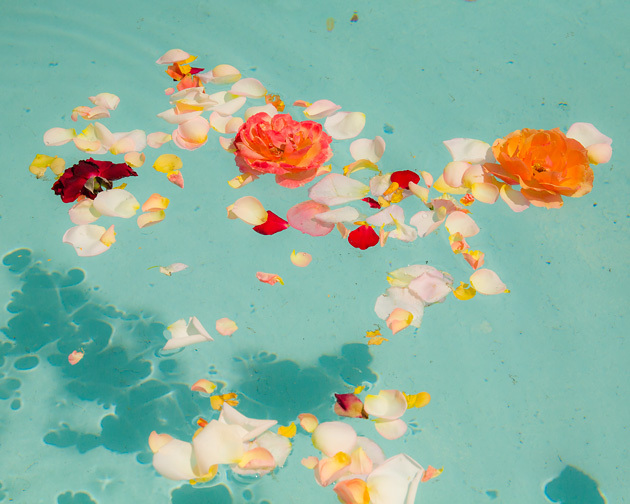 We found these roses and petals floating in a circular pond at Balboa Park’s rose garden and were immediately attracted to the photographic opportunities they presented. When we first saw them, a slight breeze had blown them all close to the wall of the pond, and one couldn’t get any of the shadows into the frame. Since someone else had clearly put them into the water (i.e. it wasn’t undisturbed nature to begin with), we found no issue with floating them a bit away from the wall, and trying to come up with a good composition. It took a couple of tries, since the arrangements tended to be either too loose or too dense, but finally I got some good shots. To me this photo has the feel of a Japanese art print. I think it comes in part from the fact that the rose petals seem to be pasted onto an almost uniform background. In fact, the physics of what we’re looking at (something floating in water) is not immediately obvious. The shadows add to the composition, but don’t seem directly connected to the flower shapes. Only upon more careful inspection does one find slight hints of what’s happening, for example the subtle wave pattern in the top left corner. Furthermore, I think the colors add to the Japanese feel. As it turns out, the white balance I used in the raw to jpeg conversion is technically not quite correct, meaning the colors in the photo don’t exactly reproduce the “real” colors in the actual scene. Instead, I took artistic license and deliberately chose a white balance with a slight yellow and green tint. This entry was posted in Picture of the Week and tagged abstract, Canon EOS 5D, Japanese art, optical illusion, roses, water. Bookmark the permalink. SPOT ON!! You could make it a tapestry!